Last year, History Hunter Military Antiques dealer and sometime Nazi War Digger Craig Gottlieb showed the Wehrmacht Awards forum for Nazi militaria a helmet that he ‘found… in the terrain where it fell in 1945‘; he revealed that, at the same time, he’d ‘found another one sticking 1/2 way out of the mud‘. So, it’s established that they were German soldiers’ helmets from the Second World War (which he exported from Latvia via Finland). Gottlieb also ‘brought back two Russian mortar tails‘ and was given ‘a beautifully ripped-open shell fragment‘. He said that, if he decided to clean it, he’d ‘definitely get help from some new friends who know what the heck they’re doing’. Since they’re new friends that he made while digging up German soldiers’ remains in Latvia (and one of his new friends’ names is “Viktors“), it’s safe to assume that those new friends are Legenda volunteers. Discussing whether and how to clean his dug-up and snuck-out finds, Gottlieb noted that he ‘was told [how to do it] by my friend Stephen who is pretty experienced cleaning things up‘. In this context, it’s safe to assume that Stephen is the ‘Chairman of the WW2 Relic Retrieval & Preservation Group (RRPG) by night and weekends’, sometime Nazi War Digger Stephen Taylor. 1. Did the Fox Entertainment Group, National Geographic Channels International and/or ClearStory run background checks on Craig Gottlieb and/or the other employees on Nazi War Diggers? 2. Was there any clause in Craig Gottlieb’s contract(s) with the Fox Entertainment Group, National Geographic Channels International and/or ClearStory that allowed him to collect any of the material that he or others found during the work for Nazi War Diggers? 3. Was there any clause in Craig Gottlieb’s contract(s) with the Fox Entertainment Group, National Geographic Channels International and/or ClearStory that allowed him to collect any of the material that he or others found outside work hours for Nazi War Diggers? 4. Was there any clause in Craig Gottlieb’s contract(s) with the Fox Entertainment Group, National Geographic Channels International and/or ClearStory that addressed potential conflicts of interest between his management of History Hunter Military Antiques and his work for Nazi War Diggers? 5. Did Craig Gottlieb and/or other employees of the Fox Entertainment Group, National Geographic Channels International and/or ClearStory work on Nazi War Diggers in Latvia in June 2013? 6. Were the persons or possessions of Craig Gottlieb and the other employees of the Fox Entertainment Group, National Geographic Channels International and/or ClearStory searched for artefacts before they left site during the production of Nazi War Diggers? 7. Were the persons or possessions of Craig Gottlieb and the other employees of the Fox Entertainment Group, National Geographic Channels International and/or ClearStory searched for artefacts before they left the countries after the production of Nazi War Diggers? 8. Were the Fox Entertainment Group, National Geographic Channels International and/or ClearStory aware of Craig Gottlieb and/or their other employees conducting excavations of archaeological sites in Latvia outside work hours, with or without Legenda? 9. Is “Stephen” the Stephen Taylor who also worked on Nazi War Diggers? 10. In which (other) countries did Craig Gottlieb and/or other employees of the Fox Entertainment Group, National Geographic Channels International and/or ClearStory work for Nazi War Diggers? 11. Were the Fox Entertainment Group, National Geographic Channels International and/or ClearStory aware of Craig Gottlieb and/or their other employees conducting excavations of archaeological sites outside work hours in the other countries where they worked on Nazi War Diggers? 12. 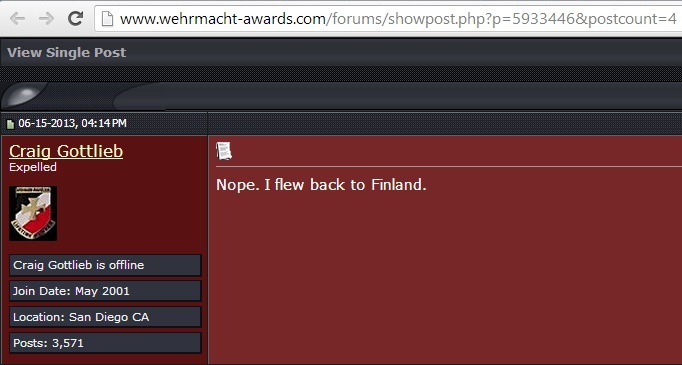 Craig Gottlieb has freely, explicitly, publicly stated that he removed German soldiers’ effects and other artefacts from the ground and exported them from Latvia via Finland to the United States(?). How did he acquire those objects? 13. Did Crag Gottlieb have antiquities permits for those objects? 14. Did Craig Gottlieb have Latvian, Finnish and/or other export licences for those objects? 15. Did Craig Gottlieb have Finnish, American and/or other import licences for those objects? As an aside, James M. implored Gottlieb: ‘Let us know if there are any issues getting this thru Latvian customs when you leave the Country.’ Gottlieb had no problems with customs, and noted his route: ‘I flew back to Finland‘. Nazi War Diggers will encourage precisely these kind of people to do precisely this: to go to countries with weak customs measures, to acquire property that could be difficult to take through customs, and to bring that all back home, where they may keep it or sell it. Similarly, kyles bullets (sic) said: ‘Nice helmet! I hope one day I can go to a battle field and search for relics just like you did. I would never sell it just like you!’ By definition, he couldn’t keep or sell it if he’d excavated it under licence and duly delivered it to the authorities (or their institutions); he could only acquire it through unlicensed digging. Even if he didn’t engage in illicit trading, it would still be an illicit antiquity, his collection would still be an illicit collection, and that society’s cultural and historical understanding would be a little poorer for every single object that every single antiquities tourist acquired. Latvian law requires newly-discovered antiquities to be reported to the state, which then decides upon the antiquities’ registration and state protection. Whether or not they are state-protected, it is ‘prohibited to export cultural monuments from the Republic of Latvia’. No exceptional licences were presented or claimed. On that basis, I characterised apparently contrary activities as illicit activities. Naturally, if such licences are presented, or if an official or expert states that such licences were not necessary in these cases, I will correct my characterisations. I love the way you are all saying what they did was illegal (which has since been proved wrong) but none of you, not one of you are bothered by the fact that an illegal video was put on youtube which was illegal, and infringement of copyright, and because of that has since been taken down. You all happily supported that, didn’t you? Apart from my belief that the sharing of that video could be defended as fair use in the public interest, I don’t believe that copyright infringement is as serious a crime as looting of graves and smuggling of cultural property. Do you? Your belief. Well, thats no good is it? Belief is subjective. Also, an argument based on belief and NOT fact should always be thrown out, as….it’s not fact. The ONLY fact is that it is illegal. Regardless of your belief. It IS illegal. Regardless of what crime is worse, it IS a crime. So I’ll say it again. You, and your keyboard warrior buddies are hypocrites. Fair use and public interest are established legal defences. It is not an established fact that the sharing of that video is illegal. A crime of necessity, which includes a less serious crime committed to stop/prevent more serious one, is also an established legal defence. If that’s the best you’ve got, give up. You’re not the smartest brick in the wall, are you? Fair use is a legal defines in this instance, is it? You’re really a bit thick. I suggest you do a bit more investigation before typing. I’ll give you a clue, though, because you obviously need it. Here’s another one, because I know you’ll need help. A crime of necessity, is it? So if I kill your Mother, because I KNOW, and BELIEVE she will try and kill a large number of people, it’s ok for me to defend myself, and kill her first? Why do people take note of your dribble? Since it was a two-minute clip from a thirty/sixty-minute-long show, they shouldn’t even need to make a defence at all. Since it documented unprofessional/unethical conduct, and since it was shared it for educational purposes, yes, its sharing was a fair use. The idea of a crime of necessity is a broad one. It does not allow people to commit crimes to prevent paranoid delusions, but it does allow genuine self-defence; it *is* the logic of self-defence. If Person A is attacked by Person B, and A does not kill B out of choice, but nonetheless incidentally or necessarily kills B in order to defend themselves, A will not be guilty of any crime, because their “crime” was a *necessity*. Some anti-war campaigners damaged planes to prevent them being used in attacks, and they were found not guilty in court, because their lesser crime of property damage was committed in order to prevent the greater crime of injury/killing. Perhaps people listen to me because I don’t make a point of embarrassing myself in public. Try harder or stop trying. Samarkeolog: I’m afraid in some cases, arguing logically will not result in a logical discussion. It’s hard to know in advance if that’s going to happen, but personal insult is usually a hint at the futility of argument. May I suggest you don’t waste your time on this one? Hahaha, ‘the smartest brick in the wall’, not heard that saying before. Sharpest tool in the box? Maybe. Next time I go and buy some bricks I’ll be sure to ask for the smartest ones. Really don’t want any dumb bricks in my wall! Insulting someone’s intelligence with a meaningless phrase, oh the irony.